The public wants anti-social behaviour dealt with "swiftly"
Police are considering asking ministers for more powers to impose "instant justice" for anti-social activities. The Association of Chief Police Officers (Acpo) is consulting members on whether to seek the authority to punish people without going to court. It has heard plans from one police chief for powers to ban teenagers from city centres and gangs from meeting up. Civil rights group Liberty said that the suggestion was "a recipe for arbitrary justice". "When you do decide that someone's been so criminal and behaved so badly and harmed other people that you need to punish them, that really is something that in a democracy belongs with the courts," director Shami Chakrabati told BBC News. "I think that you can alienate people from the police and make the police's job even harder if they are perceived to be dishing out summary justice on the street." Acpo stressed that any plans were at an early stage and may be rejected before being presented to ministers. The Home Office said proposals on the summary powers were expected in the autumn. An Acpo spokeswoman said: "Acpo is exploring the possibility of extra powers for police. Following a period of consultation, these proposals need to be accepted before any are formalised." Surrey's assistant chief constable, Mark Rowley, has proposed the measures to help modernise the way the police work. Mr Rowley said extra spending on dedicated neighbourhood police was raising hopes within communities that anti-social activity would be dealt with quickly. "It is therefore time to debate whether constables should be given substantial additional, discretionary, summary powers to meet these challenges... such powers would effectively bring existing criminal justice system powers to the street." However, the Police Federation of England and Wales warned such measures could cause problems for police. Federation vice-chairman Alan Gordon said: "As usual, Acpo have decided to go public on an initiative without consulting with those who would have to implement it. "There may be some credibility in these ideas, but our fears are it will cause greater conflict and bureaucracy for our members and could blur the lines of justice - whereby the police enforce the law and courts dispense penalties." Barbara Hopkin of the Association of Lawyers for Children told BBC's Five Live banning troublemakers from town centres would not work. "I think that we should go at it from another angle and that banning young people from a centre is just a too draconian way of dealing with it - and will make those young people feel very resentful," she said. In 2004, on-the-spot fines were introduced for low level offences such as shoplifting, underage drinking, vandalism and littering. 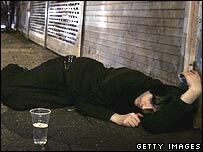 People who are drunk and disorderly may also get a fine. The prime minister has recently called for a "profound rebalancing" of the justice system in favour of crime victims.